Innovation is a key driver for the improvement of resource efficiency for cities and regions. To foster innovation and leverage the market public authorities have one powerful tool: public procurement of innovation. After almost 3 years of work, the PPI4Waste project is ready to share the main findings of all the research and activities implemented during the project's lifetime to help increase the uptake of innovative waste solutions! 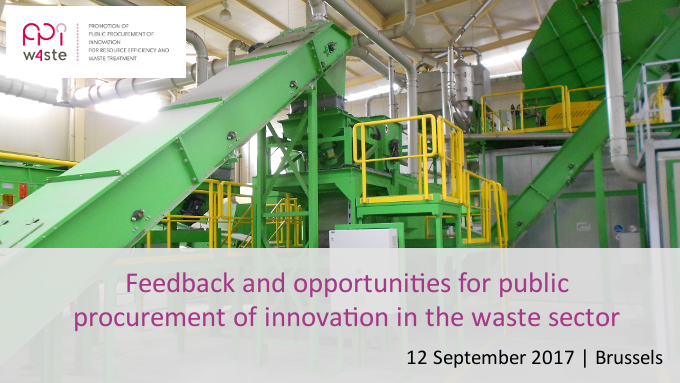 Entitled "Feedback and opportunities for public procurement of innovation in the waste sector", PPI4Waste project's final conference will take place on 12 September 2017 in Brussels (Belgium). This one day event will be divided into two sessions. The first one will present the main findings of the PPI4Waste project and how public procurement of innovation (PPI) can be experimented and stimulated in the field of waste management. It will be followed by a session exploring synergies between procurers and projects on innovative solutions. but we already invite you to save the date! Conference "Bioenergy in the EU: Converting policies into impacts"
The event "Bioenergy in the EU: Converting policies into impacts" taking place on 6 October in Brussels. This is the final event to present the results of the tender “Review of bioenergy projects implemented under IEE II”. The scope of the tender has been to assess the impact and achievements of the 47 bioenergy project supported under the European programme Intelligent Energy Europe in its second phase (IEE II, http://ec.europa.eu/energy/intelligent).